July Open Swim: Derby Dames Drawing Jam! Join us for an evening with figure drawing contests, snacks, great coffee, and a gallery reception under one roof! 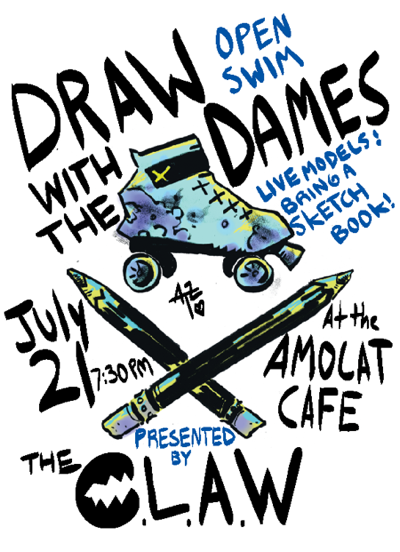 July’s Open Swim will be a live-model drawing jam featuring some special guests from Tacoma’s Derby Dames! Mia Smackabitch, Rusty O’Tulle, Gita Kraken and Red Bull Dozer have volunteered to pose in full gear, with prizes awarded to the top-voted drawings! Back to back with our drawing jam is the art show reception for CLAW member (and current Open Swim coordinator) Anique Zimmer, whose drawings and illustrations can be currently seen hanging in the Amocat’s gallery until the end of the month(see previous post).